Slapp av og nyte en fredelig ferie i vår vakre villa. Sitte ved bassengkanten i den sørvendte Lanai og se på fugler dykking i sjøen. Bassenget er alltid en lun 85 grader. Lytt til vinden i håndflatene. Du trenger ikke å bekymre deg for støyende golfbanen utstyr eller golfere inntrengende om ditt privatliv her. Villaen ligger i en rolig blindgate i et nydelig, velstelte samfunn med et stort felles svømmebasseng ett kvartal unna. Hold kontakten med høyhastighets trådløst internett er inkludert i leieperioden. Hodet ut for en forfriskende sykkeltur på noen av de mange miles av sykkelstier ligger innenfor anlegget ved hjelp av de 8 inkluderte sykler. Eagle Creek Park er en kort sykkeltur unna, og vil lokke fugletitting ferdigheter. Slapp av på en av de nærliggende Napoli eller Marco Island strender med den medfølgende strand utstyr. Få ut dine klubber og nyte en runde golf på en av de 2 offentlige golfbaner i anlegget. Nyt Players Club og Spa, satt blant svaiende palmer og bassenger av sprudlevann, The Players Club og Spa er et luksuriøst ni mål store spa tropisk retrett. For medlemmer, er det et sted å komme vekk fra livets energisk tempo. Slapp av ved bassenget, spise middag med venner, trene på treningssenteret, eller bli bortskjemt på spa. Og med Southwest Florida overflod av sol, tilbyr The Club en ideell måte å tilbringe tid under åpen himmel eller i skyggen av en privat cabana. Også 2 supermarkeder, et stoff butikk, vinmonopol og mange, mange fantastiske restauranter ligger innen en kort kjøretur, og hvis du vil, bare en sykkeltur unna. Sørvendt basseng og Lanai på en skrullete 85 grader året rundt! Nicely decorated, everything you need, access to Player’s Club was fantastic. Some minor maintenance issues were noticed. But overall this home enabled us to thoroughly enjoy our vacation. What a fantastic couple to stay at our place! Thank you for coming and I hope you can come back sometime soon! Yes, there is a brand new kitchen being installed in May of 2019 including new flooring and new bathrooms. We are looking forward to these great upgrades! ALso looking forward to many more years of wonderful guests. The home was well cared for, very clean and had everything we needed. The covered pool and lani were perfect for the hot afternoons. The location, 15 minutes from downtown Naples and 20 minutes from Marco was perfect! Thank you Gayla. Second time we've stayed here, and another great time. Villa is comfortable well and equipped. 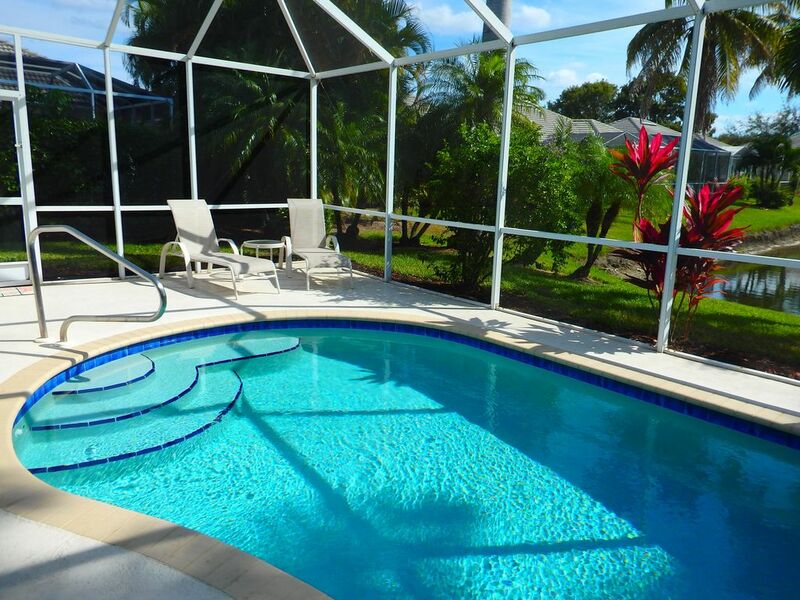 Location, midway between Naples and Marco Island, is ideal. Gayla is very responsive if you need her. Access to the Players Club is fantastic. Walmart, Publix and Fresh Market within a couple of miles. Thank you so much, Matthew, and please bring your family and come to stay again. We enjoy having you! Lovely home with great facilities. Apologies for the delay in posting this review things been so busy. We absolutely loved this house and the location. The bedrooms were spacious with good storage, washer drier etc. and bikes if you fancy a cycle around the complex. The pool was great and there was also the added bonus of another bigger communal pool a couple of mins walk away and then access to the Player's Club. There were a couple of issues on arrival which were dealt with very quickly and to a very satisfactory outcome. The house had a lovely warm, beach, relaxed feel about it and we would definitely stay here again if we were returning to Naples. Thank you so much for staying with us, you were absolutely wonderful to have. Please come and stay with us again when you are in the area! Blessings to your family. Our stay was awesome. We had a wonderful time. The house was very nice. The King mattress could use a little upgrading but everything else was good. There was plenty of everything. We enjoyed it. Looking forward to new year. Thank you for your help with the TV Brian. Players Club and Spa is optional. There is a fee of $195 for two weeks if your family would like to use this fantastic facility. Very well worth it! We love it there! It is absolutely beautiful. If you are staying longer than two weeks, please check with me for the final fee. There is a $500 Refundable Damage Deposit that will be returned within 2 weeks.